WASHINGTON — Isa Vieira is putting pressure on Congress the only way a mother of an immigrant with time-limited permission to be in the U.S. can: protesting at the Capitol. Vieira, a U.S. citizen from Boston, participated in a formal protest for the first time Tuesday. Her visits, and possible sit-ins at the offices of members of Congress, are part of a myriad of events designed to pressure Congress to pass Dream Act legislation before it recesses for the holidays. Vieira's daughter Daniella, born in Brazil, has permission to live and work in the U.S. under the Deferred Action for Childhood Arrivals program, or DACA. But in the fall, President Donald Trump ordered that those DACA permits be phased out and since then, hundreds of people like Daniella, mostly young adults and teens, have been considered to be living illegally in the country and subject to deportation. "As a mom and wife I feel desperate," Vieira said. "Daniella has been a great daughter, always been with us, helping us, encouraging us to learn English. … I don't understand why, it's so unfair." She said the trigger for her to protest at the Capitol was seeing that the end of DACA would mean 800,000 young people like her daughter would lose their permission to stay in the U.S and work. "I felt I have to do something," she said. The distress of families and individuals in similar circumstances is evident around Capitol Hill this week, where activists are pulling out the stops to put pressure on Congress. A Jumbotron is parked across from the Capitol at the start of the National Mall. The screen, visible to two-way traffic on 3rd Street NW, broadcasts video of young immigrants telling their story with the message "Call Your Elected Officials." The number connects callers to a rotating list of congressional members not yet supporting the Dream Act. Members of Congress marched from the Capitol to a tent where activists are feeding supporters coming in on buses from various cities. Vigils, caroling, a Twitterstorm, art demonstrations and other activities were planned or being held. 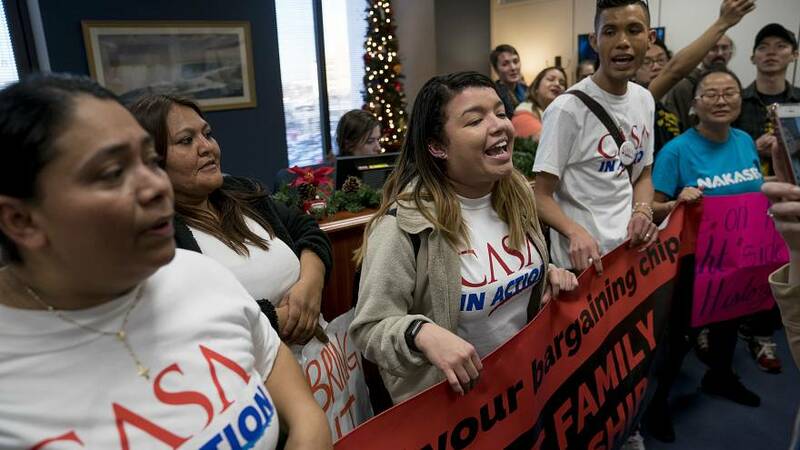 Demonstrators staged sit-ins at members' offices, including Democrats, demanding they vote down legislation that would keep government running if no action is taken on the Dream Act. A new CNN poll found that 83 percent of Americans and 67 percent of Republicans support allowing immigrant young people to remain in the U.S. under the DACA program. Opportunity for legislation is shrinking. A must-pass spending bill has been the best chance before the end of the year, but getting it may mean a government shutdown and getting enough Democrat willing to do that has been difficult. Other appropriations legislation taken up early next year could provide an opportunity, particularly if Democrats can get some concessions so the end of the year funding bill to keep government open passes. That this is all happening the week before Christmas is not lost on advocates and immigrants. At a news conference at the United Methodist Building, near the Capitol, speakers repeatedly said the issue was a matter of "morality" and noted the religious beliefs behind Christmas celebrations. Refusing to take up the Dream Act before leaving for the holidays contradicts that belief, some of the speakers said. "How dare we speak Merry Christmas?" said Sen. Kamala Harris, D-Calif. "These kids will not have a merry Christmas." Sen. Cory Booker, D-N.J., asked what greater moral calling there is than "to stand up for our neighbors who stood up for us," noting immigrants have been willing to serve and die for their country. "At this time of where religions are celebrating their high holidays," Booker said, "who are we in this country that profess to be evangelicals, that profess to be protestants or Catholics, who are we to violate the most basic tenets of your most sacred texts: to love your neighbor."